Returning home from a visit to a client late one summer’s evening, antiquarian bookseller Adam Snow takes a wrong turning and stumbles across the derelict old White House. Compelled by curiosity, he approaches the door, and, standing before the entrance feels the unmistakeable sensation of a small hand creeping into his own, ‘as if a child had taken hold of it’. 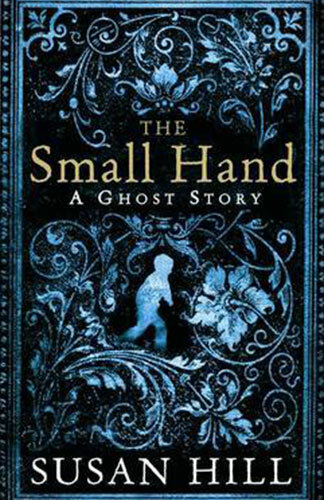 Susan Hill is probably best known to Crime Fiction fans for her Chatto and Windus series, but THE SMALL HAND is a ghost story with mysterious overtones which would appeal to anyone who is looking for something which is just simply beautifully written. A short (and sumptuously packaged) book, THE SMALL HAND is the story of antiquarian bookseller Adam Snow as he takes a wrong-turning one day and stumbles across the derelict old White House deep in rural England. Curiosity draws him towards the house, and the unmistakable sensation of a small hand creeping into his own attracts and intrigues, rather than scares or creeps him out. Drawn strangely to this house, Snow does a little research, discovering that the owner’s grandson drowned there many years before, and as he discovers more, he finds that his initial reaction to this small presence becomes more disturbed. Snow starts to experience haunting dreams and panic attacks as the small hand insinuates itself more and more into his life. It’s hard to come away from THE SMALL HAND without an overwhelming feeling of sadness, a palpable melancholy. There is a sense of aloneness about Adam Snow that is mirrored by the presence he encounters in that house. For just the shortest time it almost seems that this is simply two lonely entities that have somehow come together. But there is a gentle building of a real sense of menace in this book, not fed particularly by any mystery, more by an increasing understanding that the past has moved into the present and bought with it a profound sense of inevitability. Saying that these two – the real man and the supernatural presence – are drawn together for a reason isn’t really a spoiler as it’s obvious very early on. The reason is not that hard to narrow down for a reader looking for a “solution”, but what is considerably harder for the reader to come to grips with is the nature of damage and revenge, and the way that the past has been waiting for the present. The sheer beauty of this compact, beautiful little book is very much the sense of emotion that weaves it’s way out of the story and into the reader’s conscious. The themes of revenge, retribution, regret and that overwhelming sadness stayed with this reader for a long time after I closed THE SMALL HAND.